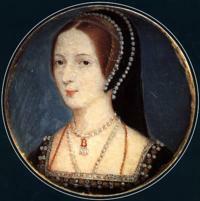 The memory of Anne Boleyn and what happened to her moves me so much that I get the goose bumps every time it emerges. Even then she was already an old soul that took life in a very compromised position. Compromised not only by her family but also her own free and independent spirit. 16th century England wasn’t exactly a place where women could freely express their will regarding infidelity, politics, the church … and she did. She was the only wife of Henry that wasn’t scared of him and openly argued her views. This was a relationship between two equally strong willed and ambicious people. They challenged each other in every single way and that is why they were a good match for a while. A match that fed both of their egos and desire for power. Considering the times when that was taking place, a disaster was bound to happen at one point or another. As we all know she lost her life and the way it happened affected hers and his karma forever … that was the start of him becoming a monster and altering his cosmic journey along with the lives of many others. Did they love each other – no. She certainly didn’t. She was in love with Percy and her heart was broken, never to mend again. Left with nothing to live for she played the game with Henry. The dangerous game of greed for power which eventually became a desperate game of survival that she badly lost. Henry – he wanted her as a woman. He lusted for her. Until he got her on her own terms. The thing is that man in this position of total control over everything around them, do not like to be challenged by anybody, let alone little women like Anne. All along he wasn’t comfortable with the power she had over him and as soon as his lust for her started wearing off he killed her. Love between them – no, I don’t think so but plenty of cosmic energy tight in various shapes of knots which altered human history. She showed the women in England that men not necessarily know best. She wasn’t shy to express her views against the papist church. With that she stirred the politics in the whole of Europe. She stood firm behind her views and I am so proud of her! In the same time Henry was such a whore – politically he sided with whoever he was married to at the time or he wanted to marry. Even in politics he was guided by his sexual instincts which made him a poor politition and a poor king to his country. Catherine of Aragon … ah … another karmic event … another soul that had claims to the throne of England – how legitimate who is to judge – however she too paid a dear price for sitting on it. Her karma with Henry was a complicated one – she kind of forced herself upon him. She had no choise – yes, I agree, but still it wasn’t a match made in heaven if you know what I’m saying … which excuses Anne of being a home wrecker in a way. It was complicated there. It’s a fact in human psychology that if the opposites are not equal – disballance occurs. That’s what happened to Henry. He claimed too much power which no one could withstand. That was the reason for his immortal soul to deteriorate to such a point that at the end of his life as Henry he was simply a disgrace to himself and the whole of England. Anne was THE ONLY ONE that openly challenged him because she was a passionate and pure soul that knew no other way but to follow her reason and her heart. She is a prime example to all of us women – we don’t need to be doormats for all the Henrys out there – yes, the price is dear and not everyone could afford it, but is always an option! Look, a lot more can be said. What happened then changed the course of history and the lives of many of us. Things are not black and white. I’m not saying Henry was a bad man. He was send to this earth for a reason. He is a lesson we as a society need to learn in order to progress and evolve. He is a prime example of what can happen when we go too far, etc. This story is a fractle of the world around us and if we pay attention we could learn a lot of valuable lessons and save ourselves a lot of trouble with different characters and situations that emerge during one’s lifetime. How do we know that Anne loved Henry Percy? If she was such an ambitious woman, who knew how to use her sexual appeal, would it be more likely that she only (or before all) pursued after a brilliant marriage by making an earl’s to fall in love in her so much that he forgot that his father wanted him to wed another bride? Further, how do we know that she was heart-broken instead of being only disappointed after her marriage plan had not succeeded? And even if it was love, could she still love a man *after* he had given up her and thereby shown himself weak in yielding to pressure, even if this was natural in those times? Yes we have no idea how she felt about Percy or Henry, she could well have had her head turned at the thought of being a countess that said, she never liked Wolsley and some historians say this was because he had broken of her engagement and she did appear to harbour this resentment for years afterwards therefore I believe her feelings for Percy could well have been quite strong for her to hate him so much, some people believe she loved Henry but I doubt that she ever did, it something that only she can answer.